GoodReader lets you import and view almost any type of text file, add annotations, and save and organize everything in an elegant file-management system. Despite its modest name, GoodReader is a stunning execution of a simple idea — one program that can import and view any media in any format, from basic .txt files to entire books and even movies. But this robust and versatile app lets you do more than just read. 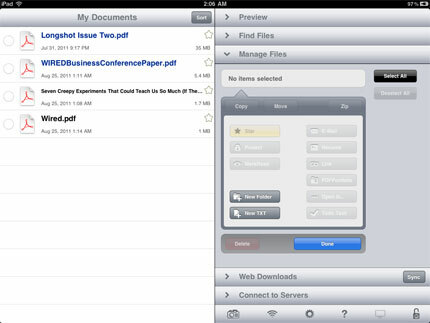 GoodReader’s elegant file management system makes the iPhone/iPad nonsystem seem worse than ever. There’s more: Let’s say someone posts a huge report on Google Docs for you to review. Import it, then use GoodReader’s sterling annotation function to mark it up with all kinds of notes and comments. When you’re done, save it, mark it as read, and send it right back to Google Docs, Dropbox, or an FTP server, or via pretty much any file-sharing method. An autosync function lets you standardize the document in both locations so no one gets confused about which version to use. Full-screen viewing on the iPad means no more squinting or zooming, and even spread layouts are easily navigated with an intuitive horizontal swipe. (If you want to zoom, though, you certainly can.) A tabbed view, with functions on the right-hand side, provides about the simplest navigation we’ve seen. GoodReader isn’t free, but its incredible compatibility and flexibility means it can replace many other apps in your toolkit. It’s quite simply one of the most useful services out there.